Join The Color Purple Book Club! 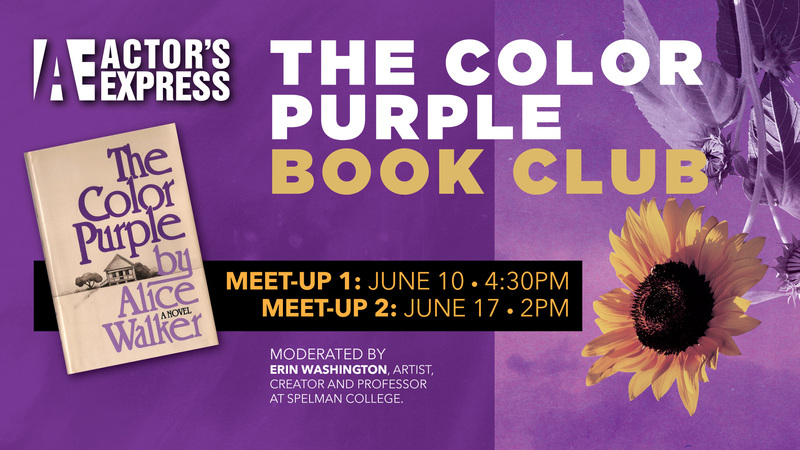 Join Erin Washington, artist, creator and professor at Spelman College for The Color Purple Book Club this summer. The AE Book Club members will read Alice Walker’s timeless masterpiece The Color Purple before meeting at the theatre twice in June to discuss the book, its themes and how it was transferred to the stage. On Sunday, June 10, club members will gather at 4:30 PM to discuss the book over catered wine and light bites. After the discussion, club members will be invited backstage for a sneak peek of how the show is coming together. On Sunday, June 17, members will return at 2 PM to watch the musical together and stay after to discuss how the book translated to the stage. Wine and finger foods will be provided for this discussion. The whole package is just $100. That includes the two catered events, a ticket to the show and great conversation. Subscribers can upgrade to this package for just $60, simply call or e-mail the box office. Space is limited to 36 members, so please sign up now and get reading! We can’t wait to see you at the theatre and share this special story with you. Reserve your spot in the book club today before it fills up. Slots are available now online. You can also call 404-607-7469 during box office hours, Tuesday - Friday from 12-5 PM. Alice Walker's The Color Purple is widely available online and in local book stores. If you're looking to purchase, we recommend using Amazon. To find a local library in Fulton County, use this locator. For a free digital copy, use OpenLibrary.org. All meetings will take place at Actor's Express at King Plow. I already bought a ticket to the show. Can I still join the club? Yes. We can use the cost of your ticket toward the fee to join the book club.